This is reproducible but seems specific to the system. Nautilus crashes and generate this report. Rodrigo, could you have a look to this one? and gnome-appearance-properties with all the icon themes looking the same. We probably have 2 bugs here and the nautilus crash being a side effect of the icon theme problem. From seb128: "to replicate this bug, remove the svg loader and try to run nautilus, or just edit the cache in /usr/lib/gdk-pixbuf-2.0/2.10.0/loaders to remove the svg loader"
Using today's daily build of the Natty LiveCD. Problem still as before even though I understood a fix had been committed. I feel that this bug is directly linked to a range of Compiz/Unity issues due to Nouveau. 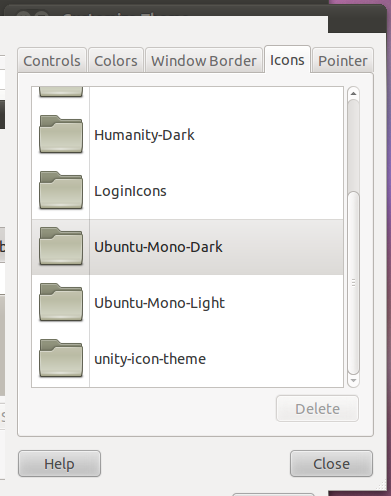 For me, the click on the Ubuntu icon, (top panel left-hand side), gives a window with a black outline and no menus or close 'x' button. This seems to be the above bug issue. the same problem. If I can help, I will.